This story follows three very different girls. Cora is a lab assistant, smart and capable, with lots of personality. Nellie is a magician’s assistant, quirky and fun, but with a heart of gold. Michiko is a Japanese fighter assistant, a little quiet, but with a heart of a warrior. The three girls meet at a chance encounter and soon as the city is plunged into panic, the three determine to do something about it. The plan leads them into the heart of danger, but together they do what girls do best, conquer. The Friday Society was a very interesting read for me. I wasn’t exactly sure what to expect going in considering the story revolved around three different characters. I’ve read multiple characters before, but they were usually stories alternating first person chapters between the three (or five). This book wasn’t the case which I found interesting. I loved getting to know the characters. The girls are all very different, so to see how Ms Kress written them was a bit fascinating. It’s always great to see how authors tackle unusual points of view or ways of writing and I had fun reading about these three. However, I wanted a little bit more of their personalities to stand out. I wanted to know a bit more about all three, but I guess that’ll come in later books. Can’t have it all in book one right? Also, more romance! I’d love to see all three of these girls develop relationships. The one that did, oh that was too cute! Also, the world Ms Kress created was believable and up front. I loved that I could picture what she was talking about. Overall, this was a great read. I’ve fallen in love with the steampunk genre and want to read all things steampunk, so this was a good one for me! 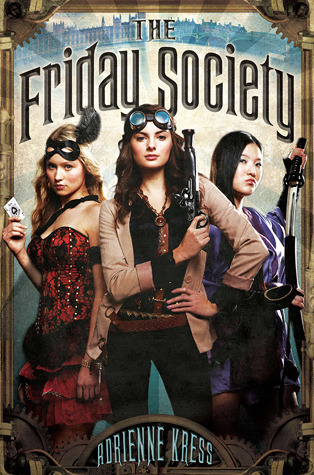 I’m not sure if there will be more books featuring The Friday Society, but I’m definitely up for me! The Friday Society comes out December 6th, 2012. Let me know what you think!